When it comes to wide receiver royalty, you know the names. Calvin Johnson, Dez Bryant, Demaryius Thomas, A.J. Green. This season, Antonio Brown of the Steelers very much vaulted himself into that company. Make room for another name: Jordy Nelson. If I were filling out an All-Pro ballot right now (and there’s still a long way to go), Brown and Nelson would get the nod, just edging out Thomas, who leads the league in yards. I was at 1265 Lombardi Avenue in 2008 when the Packers traded their first-rounder to the Jets; Nelson, relatively unknown coming out of Kansas State, was their first pick, at 36th overall. Packers fans greeted the selection with a collective, Huh?, considering that Green Bay already had Greg Jennings, Donald Driver and a promising James Jones in the receiving corps. Nelson wasn’t the fastest guy (4.51 seconds in the 40-yard dash) and certainly didn’t have elite jumping ability (31-inch vertical leap), but he did have the necessary physical skills. He’s big at 6-3 and 217 pounds, and he has deceptive speed because he’s a long strider. His best attributes coming out of college were his hands and his strength, and he has developed into a Larry Fitzgerald-esque player because of those skills. Mostly, Thompson saw him simply as a good football player. 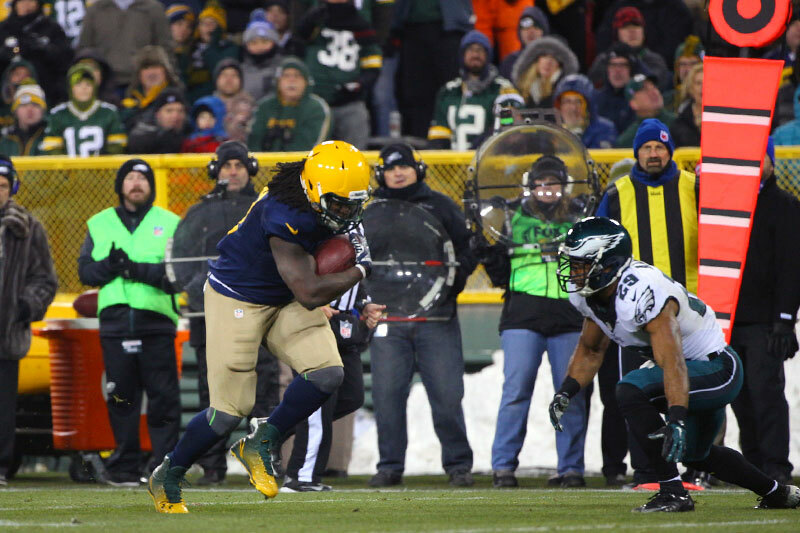 Now in his seventh season, Nelson has soared into the elite category for two reasons (both were on display during Sunday’s 53-20 victory over the Eagles, when Nelson had four catches for 109 yards and a touchdown). First, there’s the mental side of the game. There may not be a better receiver in the NFL when it comes to reading coverages, adjusting and running routes precisely in sync with his quarterback. That game-within-a-game is how a player like Nelson, who isn’t the fastest and who won’t win many jump balls, creates the kind of space that more gifted receivers can struggle to get consistently. 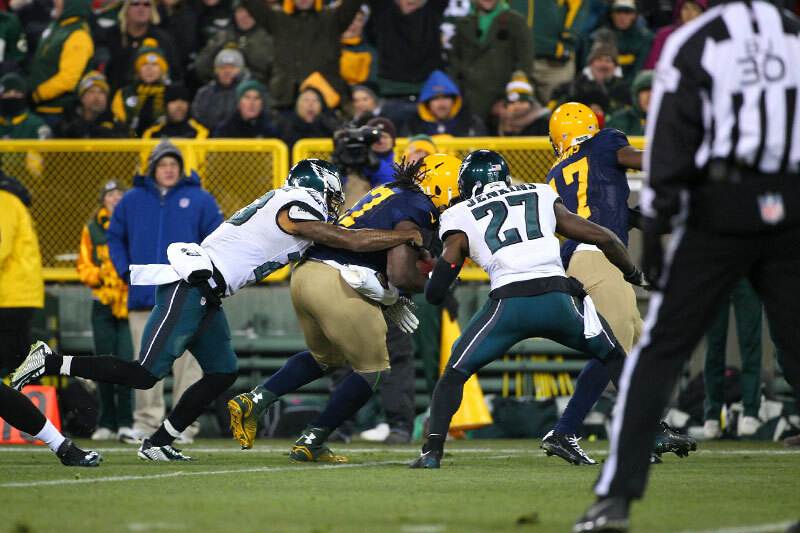 On Sunday, Aaron Rodgers and Nelson set the tone for the game on the third play from scrimmage with a 64-yard strike down the right sideline against Philadelphia cornerback Bradley Fletcher, a solid cover man. 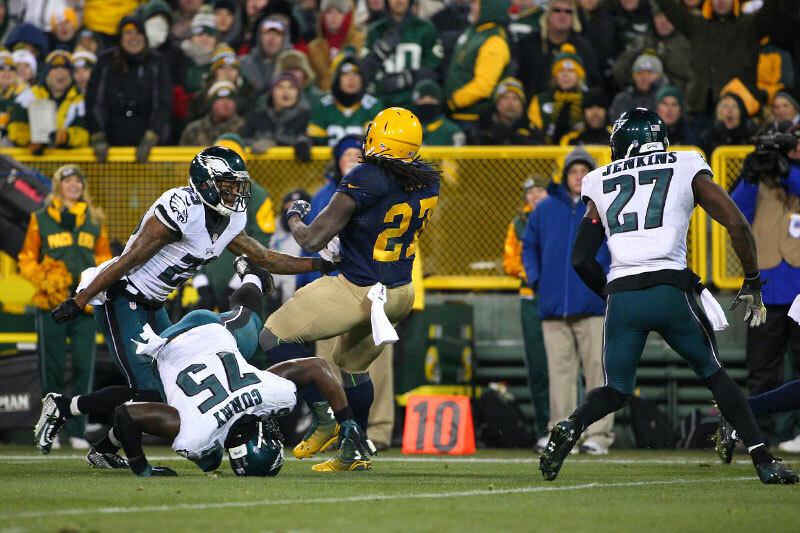 The Eagles brought pressure and played man coverage underneath a deep safety. Fletcher was in phase (shoulder to shoulder) with Nelson most of the way down the field, but Nelson created more room by stemming his route toward Fletcher, opening up about five yards between Nelson and sideline. 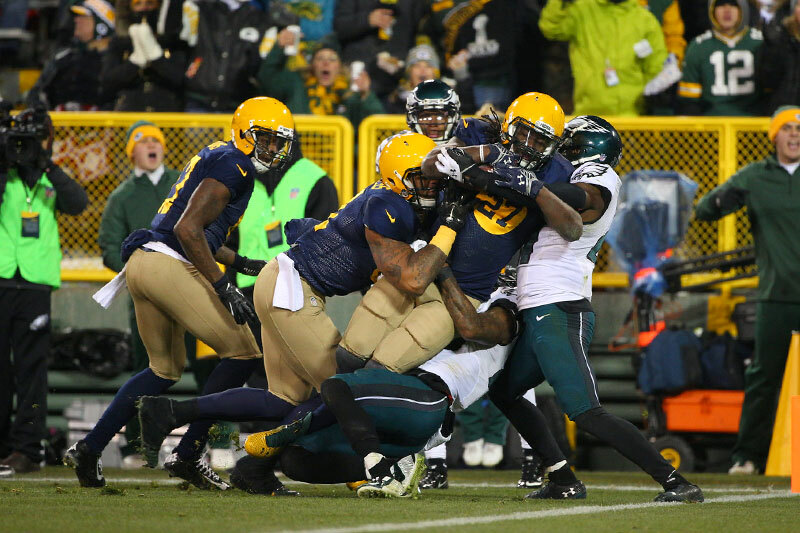 Rodgers put a perfect ball about two yards from the sideline. Nelson did the same thing, just with less space, against the same coverage and cornerback on his 27-yard touchdown with 10:39 left in the second quarter. Nelson angled his route toward Fletcher, giving Rodgers two yards to shoot for. The league’s best quarterback hit the mark again, and then Nelson displayed his other elite asset: body control and footwork on the sideline. 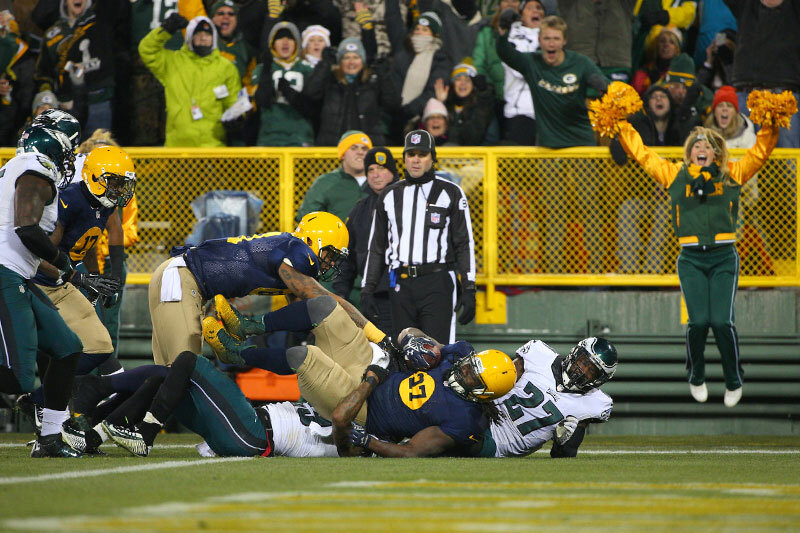 Nelson somehow tiptoed into the right corner of the end zone to give the Packers a 24-3 lead. Both of those plays were extremely difficult, but Nelson made them look easy. That’s the genius of his play: making the ridiculous mundane. Other players might be bigger and faster, possess longer arms and a bigger vertical leap, but no one is better at creating the room needed to make a play on the sideline (and then executing it). And we didn’t even discuss the back-shoulder fade, which can’t be defended when executed properly, and there’s no better back-shoulder duo than Nelson and Rodgers. Again, they make the difficult look easy. 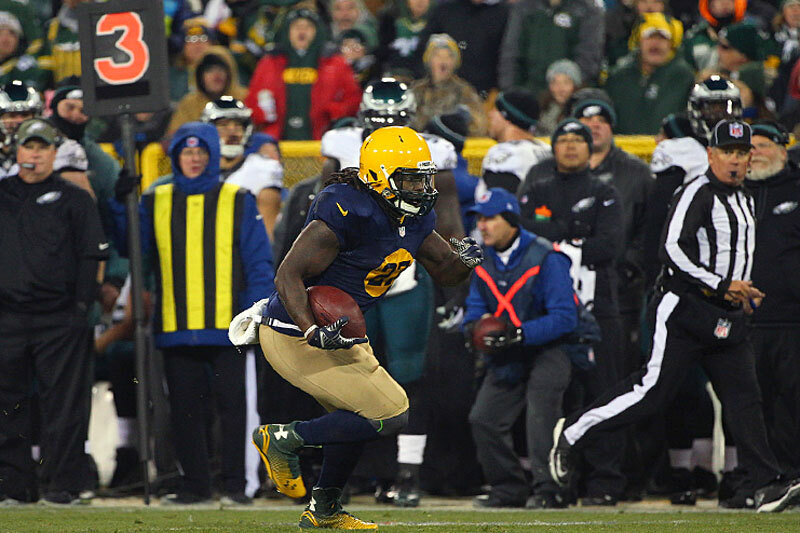 Nelson served notice in 2011 when he had 1,263 yards and 15 touchdowns on 68 catches. He built on that with 1,314 yards and eight touchdowns on 85 catches in ’13. This season, with a possible showdown against Darrelle Revis of the Patriots in two weeks, Nelson is on pace for 96 catches for 1,597 yards and 14 touchdowns. Nelson hasn’t been to a Pro Bowl yet, let alone been voted All-Pro. But if he continues to play like this—and there’s no reason to think he won’t—that will come to an end. It’s time to recognize Nelson as one of the elite. 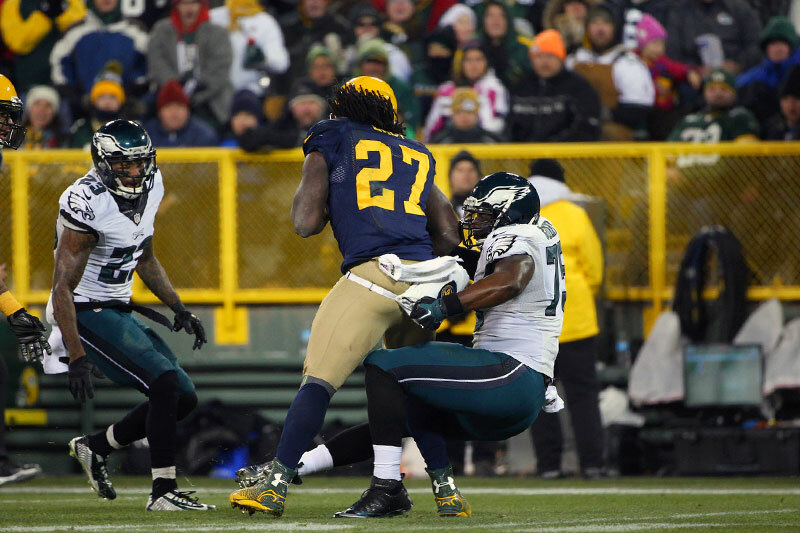 Eddie Lacy channeled his inner Marshawn Lynch on a 32-yard TD run-and-catch against the Eagles. 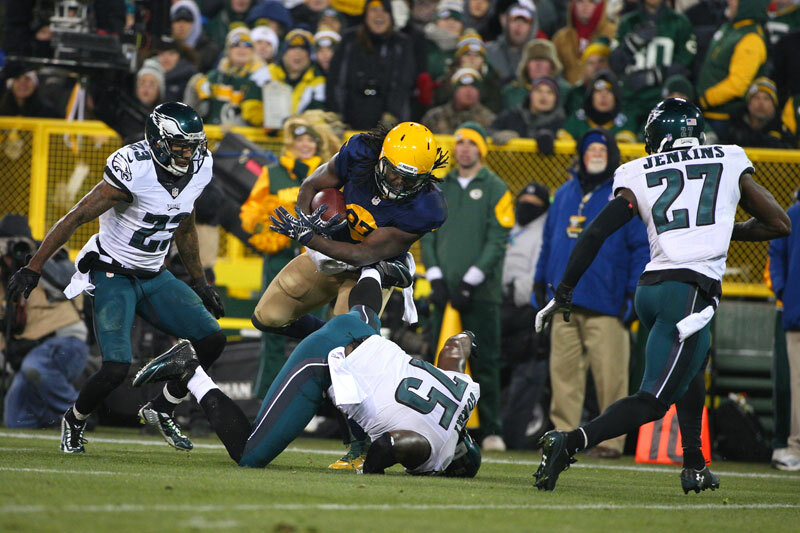 With 14:52 to go in the fourth quarter, Lacy catches an outlet pass from Aaron Rodgers in the left flat. He sees defenders down field . . .
. . . takes on safety Nate Allen at the 17-yard line. . .
. . . and slips through Allen’s grasp. Near the 12, defensive end Vinny Curry tries his hand . 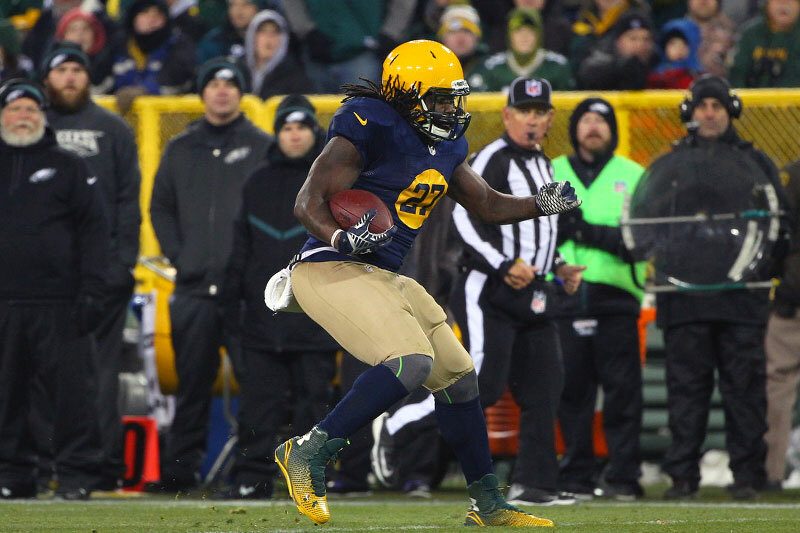 . .
. . but the 230-pound Lacy spins free of the 280-pound Curry. Lacy has his back to the goal but keeps the momentum going. He rights himself as more Eagles defenders converge at the 5. 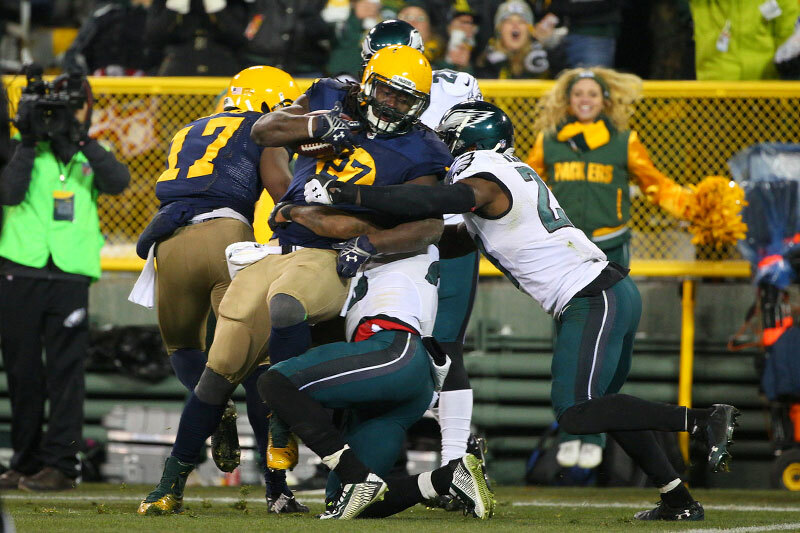 Lacy spins again into the pile . . .
. . . and with a little nudge from tight end Andrew Quarless, powers into the end zone. 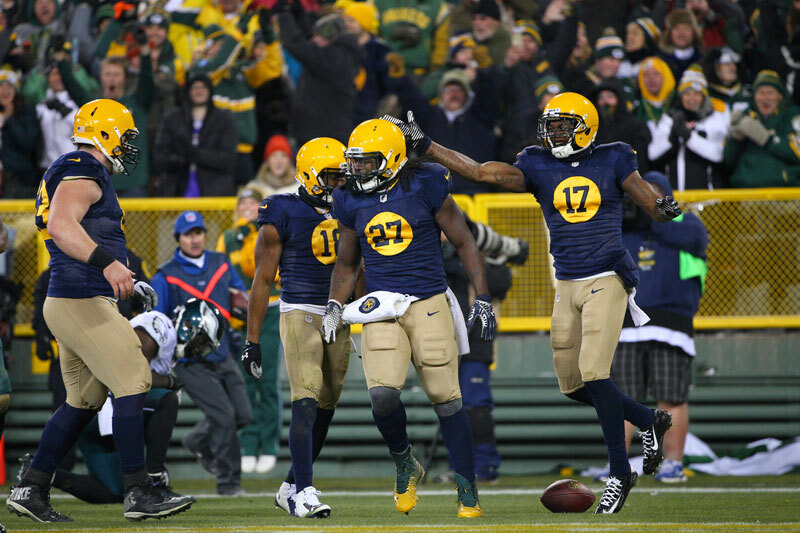 The touchdown put the Packers up 46-13 on the way to a statement win. 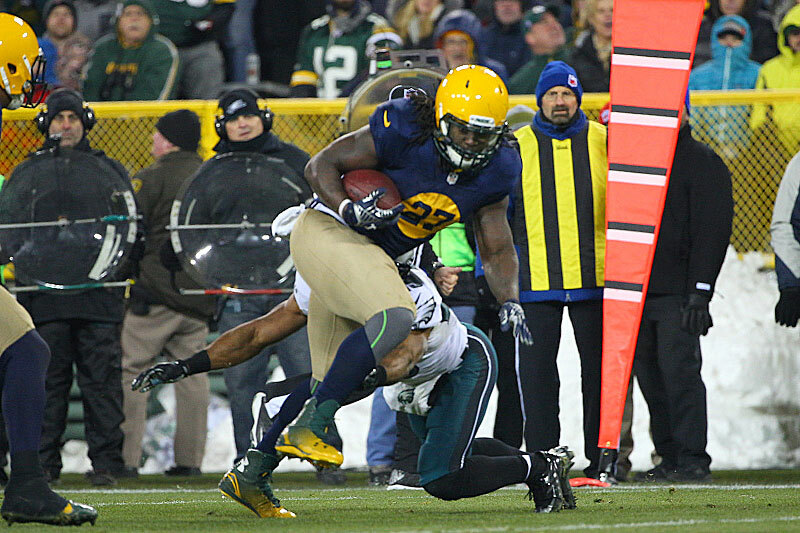 Lacy, in his second year out of Alabama, also had a 37-yard TD run.